This traditional Eastern European peasant soup is a delicious way to use up some of the late summer harvest. 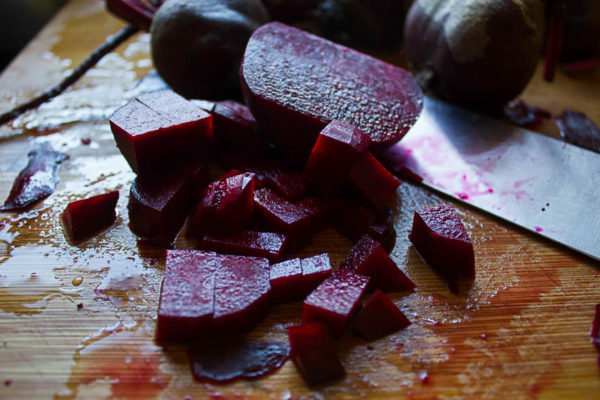 Beets are full of vitamins and minerals, and paired with carrots, potatoes and cabbage, this hearty dish is full of both flavor and nutrition. The soup can be made with or without beef, and can be made with whatever vegetables you have on hand. Some people put beans in, some people leave the cabbage out…the one thing that is very important to the overall flavor is the vinegar. 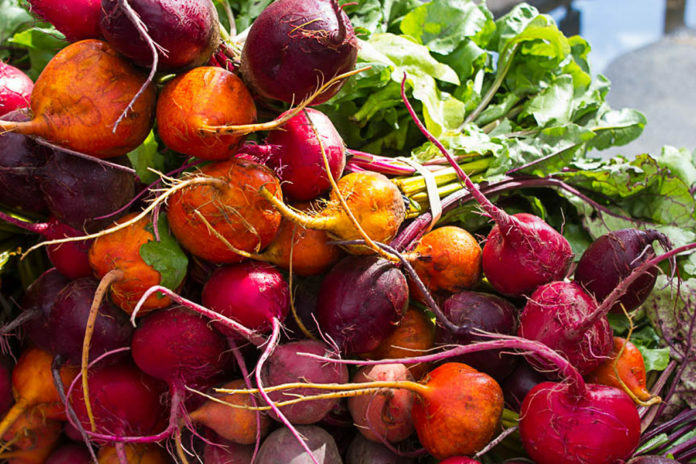 Vinegar, or some other acid, brings out the glorious flavor of the beets, and brightens the rest of the vegetables, too. This traditional Eastern European peasant soup is a delicious way to use up some of the late summer harvest. 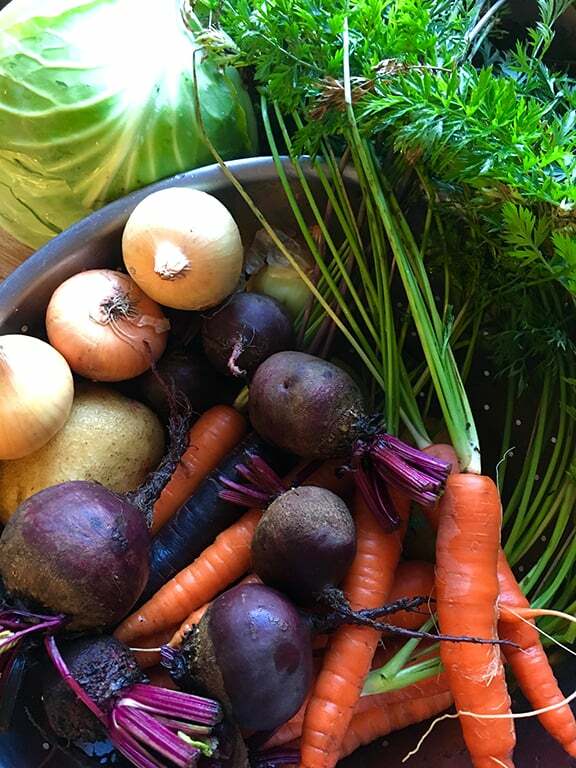 Beets are full of vitamins and minerals, and paired with carrots, potatoes and cabbage, this hearty dish is full of both flavor and nutrition. The soup can be made with or without beef, and can be made with whatever vegetables you have on hand. Some people put beans in, some people leave the cabbage out...the one thing that is very important to the overall flavor is the vinegar. Vinegar, or some other acid, brings out the glorious flavor of the beets, and brightens the rest of the vegetables, too. Rinse your meat and place on a plate or platter. Pat beef dry and season liberally with salt and pepper. Let this rest while you are cutting up all the vegetables. Prepare all vegetables by cutting into a nice medium dice. Add oil to IP and turn on saute normal. Add beef and brown, letting the beef develop some deep brown spots by not stirring too much. You may have to do this part in two batches. 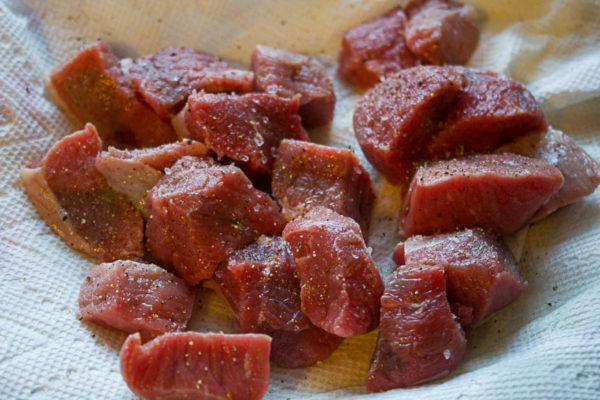 Remove meat to a clean plate. If meat is really sticking to bottom, add a little more oil or broth to deglaze the bottom of the pan. Add a little oil to the pan, and then your diced onions. Let them saute for about two minutes, then add your garlic cloves, and stir to cook the garlic just for about 30 seconds. Add the box of beef broth, very slowly at first, to deglaze the pan. Then add in the tomato paste and vinegar, and stir. Add the vegetables, and then the water. The liquid should come up almost to the fill line on the inside of the pot. Lock the lid of the IP into place, and then push manual for 25 minutes. Make sure your toggle is set to sealing. With a full pot, it will take a while to come up to pressure. When the timer goes off, let the soup sit for at least 10 minutes of natural pressure release. Then you can go ahead and release the rest of the pressure. Ladle a little of the soup into a bowl and let it cool to taste. Adjust your seasonings. The traditional way to serve borscht is with a dollop or sour cream or yogurt, and maybe a little sprinkling of dill for color. Borscht is delicious with rye bread for a hearty meal! Next articleSpaghetti: Take Your Instant Pot to Work Day!